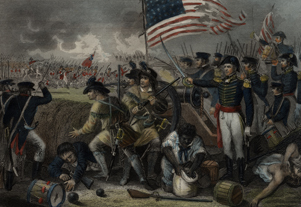 The Battle of New Orleans began in deadly earnest just after dawn on January 8, 1815 as several regiments of British infantry marched in orderly ranks toward the carefully prepared defensive positions of General Andrew Jackson’s army. Crossing open ground with little or no cover, the British were cut down like so many stalks of corn by the artillery and rifle fire of the Americans. In the finest tradition of the British military, British General Edward Pakenham rode among his troops encouraging them to press onward until he himself was scythed from the saddle by an American cannon blast. 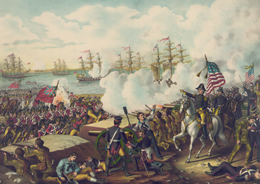 The battle had lasted about two hours and resulted in a lopsided victory for the Americans. 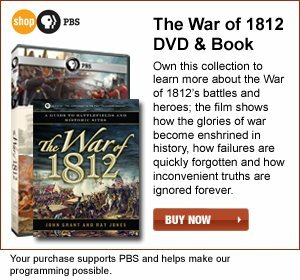 Ironically fought two weeks after peace terms had been agreed to at Ghent in Belgium, the battle brought the War of 1812 to a resounding conclusion. Administered as part of Jean Lafitte National Historical Park and Preserve, the Chalmette Battlefield enables visitors to relive this important—some might say pivotal—battle, if only in their imaginations. Some of the battlefield has been swallowed up by the wandering Mississippi, but what remains is evocative of the past and eerily beautiful. The ruins of the American earthworks and of the canal that served Jackson’s troops as a moat can still be seen. Markers describe the action and interpret key points of interest. A striking feature of the park is the Chalmette Monument, which was begun in 1840 and not completed until 1908. The marble monument rises over 100 feet above the surrounding river floodplain. The park is located a few miles south of New Orleans on Louisiana Route 39. Built in 1723 to protect the important coastal settlement of Mobile, Fort Conde was at various times held by the French, British, Spanish, and American militaries. Built of brick, stone, earth, and cedar, the fort was an impressive structure covering almost 11 acres. It was the site of a significant Revolutionary War battle in 1780 when Spanish troops and their American allies forced the British garrison to surrender. 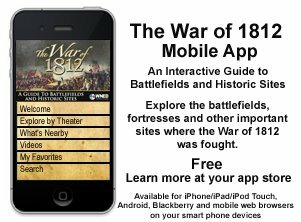 Fort Conde remained in Spanish hands until April 15, 1813, when General Wilkinson seized Mobile. Moving five gunboats in close to the fort, Wilkinson surrounded it with his militia and forced the garrison to surrender its small garrison. 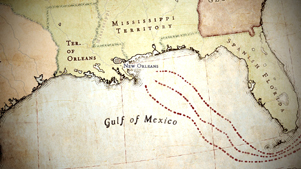 Andrew Jackson would later use the fort as a base during his campaigns at Pensacola and New Orleans. The fort seen today is a reconstruction built on a slightly smaller scale than the original. Located near the corner of Royal and Church Streets near the Mobile waterfront, the fort houses the city’s official welcome center. During the first two years of the War of 1812, the South was aflame with rebellion as a Creek Indian faction called the “Red Sticks” torched farms and villages. On March 27, 1814, however, General Andrew Jackson defeated and scattered the rebels at the Battle of Horseshoe Bend. About 1,000 Red Sticks led by a fierce war chief named Manawa, had dug entrenchments across the open end of a horseshoe peninsula on the Tallapoosa River and there awaited Jackson. Unfortunately for the Indians, Jackson was able to break their lines and overwhelm them with well aimed artillery and rifle fire. More than 800 of Manawa’s warriors were slaughtered in the desperate hand-to-hand fighting, while Jackson lost only 26 of his militiamen. The site of this crucial frontier battle is preserved within the 2,040 acre Horseshow Bend National Military Park near Dadeville, Alabama. A visitor center and museum located off Alabama Highway 49 helps put the battle in perspective. Historical markers at various points on the battlefield describe the fighting. The Jean Lafitte National Historical Park and Preserve administers a number of natural areas and historic sites, most of them not directly related to War of 1812. Among them, however, is the Chalmette Battlefield where Andrew Jackson’s outnumbered army of misfits dealt the British military one its worst defeat’s in history. The park is named for Jean Lafitte, the famous pirate said to have cut a deal with Jackson to provide additional troops and support for the American army. Before the nineteenth century, a general lack of roads delayed development of the continental interior and made settlement of the region more difficult for Easterners and Europeans. Of course, the Mideast and the Mississippi Valley would not remain a trackless frontier forever, and by the early 1900s white traders and settlers had begun to use an old Indian forest trail that linked the Cumberland and Mississippi Rivers. Called the Natchez Trace, it stretched nearly 500 miles from Nashville, Tennessee to Natchez in what is today the state of Mississippi. Early in 1813, Andrew Jackson led a small army of Tennessee “volunteers” down the trace to Natchez. Nowadays a federally owned and maintained parkway follows the approximate route of Natchez Trace. The tree-lined roadway stretches the entire distance from Nashville to Natchez, and driving it at the posted speed limit of fifty miles per hour can take the better part of two days. There are no fuel stations or restaurants and very few buildings of any kind along the Trace, but services can be found a short distance beyond most of the exits. A National Park Service visitor center complete with museum is located in Tupelo, and historic sites can be seen at various locations along the Trace.